Discover if You are Seme or Uke! This is the result if Uke-in-Training! has the highest score. 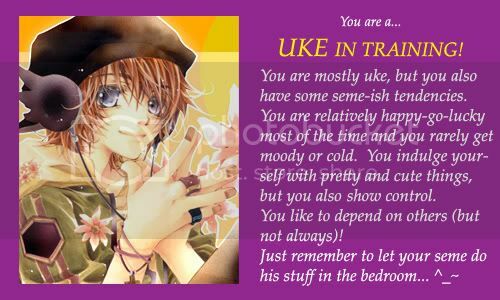 This is the result if 1/2 Seme, 1/2 Uke! has the highest score. This is the result if Seme! has the highest score. well, thing is, he is soo cute sometimes, and lovable, but the rest of the time is kinda annoying xDD cause, why does he say one thing and then the oposite? I got the same thing as you!! do yo know how to sub things? as in put in the lyrics/comments/what their saying into a video?